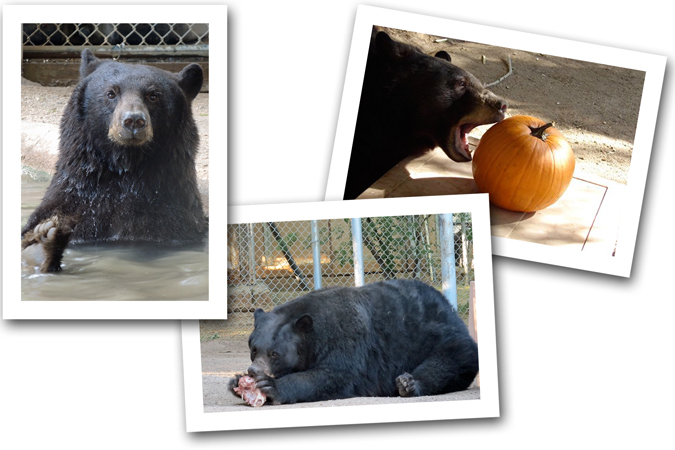 Cinnamon is a gorgeous, dark, round bear, but you might not see her if you visit the sanctuary. She can be quite shy, and, except for her favorite keepers, she doesn’t like people much. What does she like? Meal time! Cinnamon was born in 1999 in the Santa Catalina Mountains outside of Tucson. A family who lived out on Mount Lemmon began to feed the mother bear and Cinnamon (who was just a baby). The bear family became habituated to people and a problem to have around. Now labeled “nuisance” bears, they were captured, tagged and relocated. However, Cinnamon had learned to associate people with food and that often doesn't turn out well. “Nuisance” bears are given a couple of chances, but Cinnamon found herself in trouble again and without a sanctuary to take her, she would be destroyed. She’s been at Southwest Wildlife for many years and these days she shares an enclosure with Heavenly bear. Since she doesn’t care to socialize much she often stays in her den area during the day and Heavenly has access to the pool and waterfall. In the late afternoon, Heavenly goes off to his den for his meal and Cinnamon is shifted so she can enjoy the pool and waterfall throughout the evening and night. Each morning she’s happy to retreat, back to her quiet den, where she won’t have to interact with people and Heavenly is happy to be the center of attention.